Faced with a staggering corrections budget, Kentucky has become the latest state to enact substantive sentencing reforms. It's been more than a year since medical marijuana became the law of the land in New Jersey, but the fight goes on. A former Mexican governor admitted that the previous PRI government negotiated deals with drug cartels to keep the peace. Was that a better strategy than what Calderon is doing now? 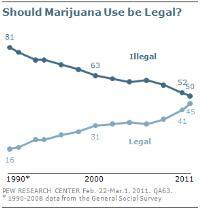 Here's yet another public opinion poll showing a rising trend-line for freeing the weed. Washington could be the next medical marijuana state to allow dispensaries after a bill to do so passed the state Senate. It now goes to the House. MedicalMarijuana.ProCon.org, part of the ProCon.org family, is an in-depth web site presenting information and views from a variety of perspectives on the medical marijuana issue. The Chronicle is running a series of info items from ProCon.org over the next several weeks, and we encourage you to check it out. A second deputy US marshal has been killed trying to apprehend a drug suspect this year. The fugitive was also killed. They are the year's 14th and 15th deaths related to drug law enforcement. Being the subject of a drug search warrant proved fatal for a young Massachusetts man last Friday. It's a veritable cornucopia of drug-related law enforcement corruption! We don't even know where to begin -- just jump in, but don't forget to take a shower after you're done. The disaster that is Mexico's drug war has moved a Council on Foreign Relations scholar to call for the US to rethink its failed drug policies. Scotland's Liberal Democrats want to reduce the harm to users and society alike by making heroin available through prescription.